Here is another treat for dinner. Risotto with real truffles, an exclusive and seductive choice for a romantic dinner. Melt butter and olive oil in a skillet. Blanch onion and garlic until golden, then add truffles. Pour in rice and allow it to be covered in the butter and oil, and add dry vermouth. Stir while the wine evaporates. Then add 10 cl stock at the time, and stir so rice does not stick in the pan. Allow to be soaked up by the rice each time. Season if necessary. Add parmesan cheese, and a generous drizzle of truffle oil when serving. 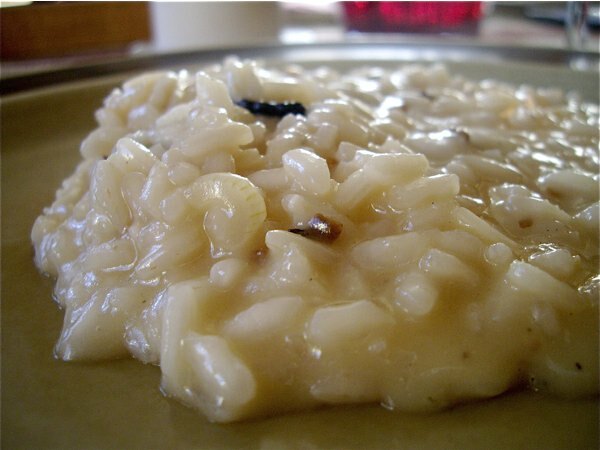 Rustic bread and a dry white wine is perfect as company to the truffle risotto. Upgrade to a white truffle risotto! See this clip on YouTube.